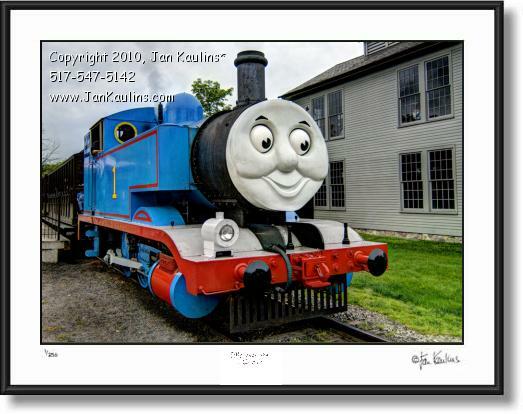 THOMAS THE TANK ENGINE TRAIN Greenfield Village photo picture print art photography for sale. This is a very colorful delightful image of THOMAS THE TANK ENGINE TRAIN photo picture art print for sale on his visit to Greenfield Village in Dearborn Michigan. Thomas The Train comes to Greenfield Village only once in a while so it was a wonderful opportunity to capture this image with my 5 year old son standing by my side. We'd just taken the ride on Thomas and decided to walk around scenic Greenfield Village and get a photo of him slowly moving down the track with smoke billowing from his stacks. This is an original High Dynamic Range color THOMAS THE TRAIN photo art print photograph created by nationally recognized artist/photographer Jan Kaulins. It is one of the newest artistic images in his most recent series of photographs. Each photograph has been created from multiple bracketed photographic digital exposures and then layered together into one photographic image. It is then ‘tone-mapped’ where individual areas of the photo, as well as contrast, saturation and other qualities of the image can be artistically manipulated to bring out the artistic effects that make these photos so visually unique. Some of the photos in this series are even further enhanced for artistic effect giving them an almost painterly or graphic silkscreened look. THOMAS THE TRAIN Greenfield Village photo art print for sale.